This is something I always wanted for my game : a space saver more realistic than stealth stairs and teleporters. Until now, like many other people I've been happily using Targa's ladder stairs despite the lack of animations - but thanks to Wes_H and his new Animesh exporter for Milkshape, this isn't an issue anymore! The base object was cloned from Targa's ladder stairs; the mesh was replaced but I kept his original footprint. So this ladder takes only 2 tiles, 1 for the ladder itself and 1 for the landing. 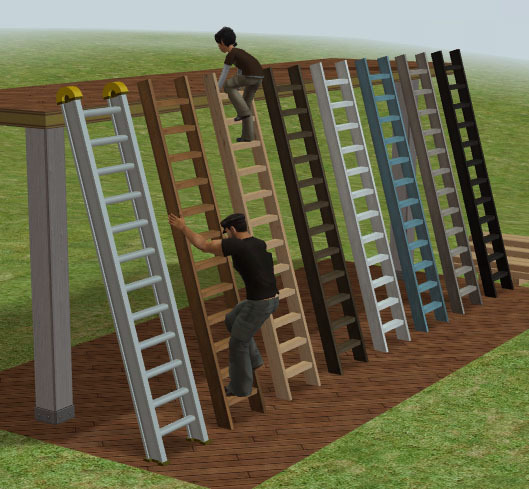 - the "Marvine-ladder-animated" with 7 recolours : light wood, dark trashed wood, white, grey, black, blue, and a raw wood texture by Beosboxboy. The base object uses a warm medium wood texture, don't delete that one in game! - the "Marvine-ladder-animated-metalClone", mesh and texture by Beosboxboy, for an industrial look. The packages were tested with Seasons and with base game only, I don't think the minor last minute changes will affect that. - when climbing down, the sim turns a little briskly to face the ladder and to walk away; this is the only workaround I found for a skeleton settings issue. If you notice anything else, please let me know! Redistribution policy: you're welcome to recolour, clone and modify with appropriate credits - don't upload on pay sites or the Exchange. Biggest thanks: to Wes_H of course, being his guinea pig was a priviliege , to Echo for answering my dumb questions, and to both Echo and John Brehaut for their great tutorials that got me started. And, of course, to all the people that made this possible with their tools, research and advice!